Winter sports are undoubtedly fun, but they can also be very dangerous. Snowboarding is rated among the top ten most dangerous sports, and all you have to do to see serious and quite horrifying winter sports accidents online is to type ‘snowboard accident’ or ‘ski accident’ into a search engine. With many serious and not so serious accidents that happen in the snow and on ice, it’s apparent that most of them could have been prevented if the boarders or skiers had taken appropriate safety precautions. So the most important thing to talk about is how to try and avoid accidents in the snow and ice in the first place. It’s important that if you are going to be taking part in winter sports, whether out on a snow board, skiing, ice skating or taking part in any other dangerous sports, that you wear the right protective head gear. When it comes to going down the slopes at breakneck speed, wearing a properly designed helmet could really save your life. If you go take part in winter sports such as snowboarding and skiing without a helmet, you run a high risk of serious sports injury if something goes wrong. Nobody likes to think that a winter sports injury is going to happen to them, but it’s far better to assume it might and dress accordingly. Watch Out for the Chair Lift! One of the most dangerous areas on the ski mountain is actually the chair lift. 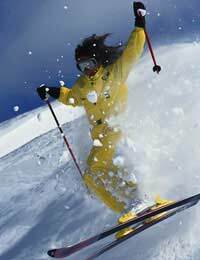 Many a skier or boarder has found to their cost that not concentrating during the critical moment has resulted in injury and embarrassment. Knee injuries can often happen when dismounting the lift, and also if someone else steps on the back of one of your skis. If you ride on quad chairs, try to always sit on one of the outer seats so that you only have to avoid one person when disembarking. And if you’re skiing, try not to share a chair lift with snowboarders, as they have to sit with their snowboards at 45 degrees, then pivot when they get off, and so the potential for trapping the back of your ski increases - which can result in a backward twisting fall, and a painful knee injury. Don't just rush in before thinking about your own safety, the safety of the scene and that of the injured person. Rescuers don’t want to have to rescue even more people, no matter how well meaning they are. Make sure that the scene of the accident is made safe – don’t venture onto an avalanche prone ski slope or under cliffs where you could be at risk from falling rocks and snow. Check to see how bad any injuries and if the casualty is going to need immediate first aid. If it’s more embarrassing than serious, you can help the person back down the mountain, but if you think the injury is a serious one, you should place markers several metres uphill from where they are lying and either cross your skis upright in the snow, or leave your board there to indicate the scene of an accident. Release the casualty's bindings, but you should leave their boots on unless absolutely necessary. If you are absolutely certain that there’s no spinal injury, you should also put them into the recovery position, on their side. Try to make sure that they are kept as warm as possible, as you don’t want frostbite or hypothermia to add to their injuries. If you’re part of a group, send someone to get help and make sure that someone stays with the injured person, so that a lift operator can contact the ski patrol and arrange for the casualty to be recovered from the slopes. Stay calm, and try and keep them still. Most winter sport injuries while skiing or boarding tend to be more to the pride than anything else, but it’s always wise to take precautions...dress properly, take a mobile phone with you so that you can call for help if needed, and don’t ski or board alone.